Garlic (Allium sativum) is a perennial member of the onion family, but in Georgia it produces best when it's treated as an annual and planted in the fall. Fall planting allows garlic to take advantage of the mild Georgia winter and beat the heat of the Georgia summer. Garlic is hardy in U.S. Department of Agriculture plant hardiness zones 3 through 8, so virtually all varieties are able to grow in Georgia, which spans from USDA zone 6a in the north to USDA zone 9a along the Atlantic coast. But hard-neck types do best in areas with harsher winters and cool springs, so they might struggle in mild Georgia winters and warm springs. Soft-neck types are better able to handle Southern climates. Recommended varieties for Georgia include "California Early," "Silverskin," "Mild French," "Chet's Italian" and "Inchelium Red." The development of a garlic plant happens in two distinct phases; its leaves grow in the cool days of the early season, and the bulbs develop later, after the weather warms and leaf growth stops. 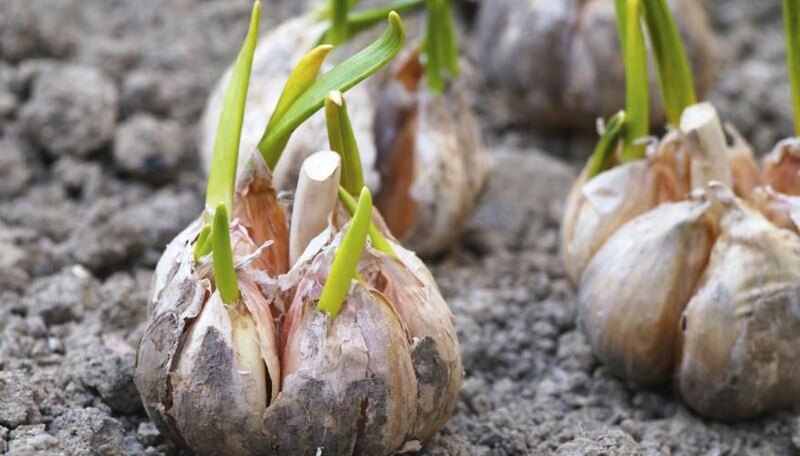 For the plant to develop large bulbs, it needs to have enough time left in the growing season for bulb development after leaf growth ceases, so garlic is often planted in the fall or early winter to give the plant a head start on the coming summer. In Georgia, the time for planting begins in late September and continues through November. Spring planting is not recommended. Garlic grows best in soil that's well-drained, loose and rich in organic matter. Adding organic matter to the planting bed before planting will both improve the nutritional content of the soil and improve its texture; bulb development is best when the plants are grown in a crumbly soil. Add about 100 pounds of composted manure for each 100 square feet of planting area. Garlic also appreciates a substantial amount of supplemental nitrogen fertilizer. Before planting, incorporate about 3 pounds of a 10-10-10 dry fertilizer per 100 square feet of planting area. Individual garlic cloves need to be planted with their pointed ends, from which the leaves will sprout, facing up. If they're planted with tips facing down, the plant's neck will be distorted and the bulbs will not develop well. Divide the bulb into separate cloves immediately before planting, and leave the skin on the cloves. Don't use garlic purchased at a grocery store. Plant them in a trench 1 to 3 inches deep, and space them 6 inches apart. If you're planting more than one row, space the rows 12 to 14 inches apart. Cover the seed cloves with soil and water thoroughly. Take care with future watering to keep the soil moist but not saturated; garlic bulbs will rot in soggy soil. Garlic requires about an inch of water per week.